Our team continues to develop Kanban Tool's functionality, keeping the product powerful and scalable for large organizations. 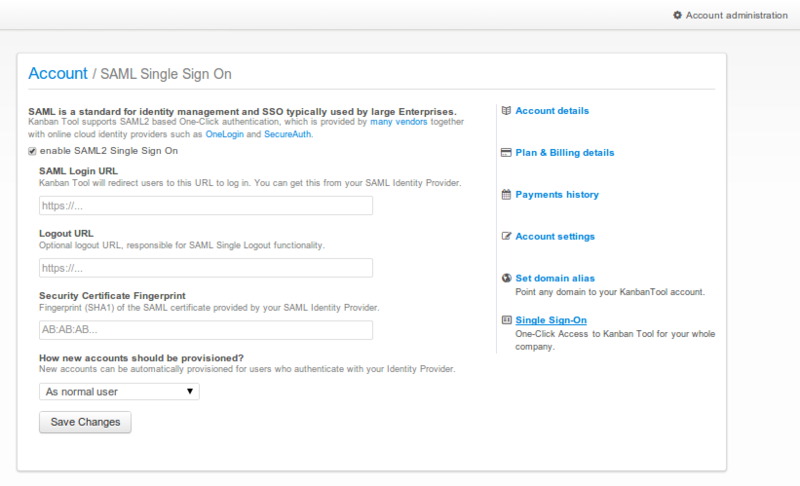 Now, we are happy to offer you quick and secure access to Kanban Tool with SAML2 based One-Click authentication. This solution will help you centralize the access control and allow your employees to access Kanban Tool and other services without a password. Identity management and single sign on is provided by many vendors, including online cloud identity providers such as OneLogin and SecureAuth. To learn how to configurate it, please visit our support site.